They finally got Larry Summers. After a short and controversial tenure as president of the world's most prestigious university--Hardvard University, that is--Larry Summers is stepping down. His resignation will be effective at the end of this semester, and he will return to the classroom to teach. Summers has a distinguished history. He entered MIT at the age of sixteen, and went on to Harvard to earn his doctorate. At the age of twenty-eight, Summers became one of Harvard's youngest ever tenured professors. He has taught at both Harvard and MIT. He was the World Bank's chief economist from 1991 to 1993 and served a short stint as Bill Clinton's last Secretary of the Treasury. Check a twenty dollar bill from the tail end of the Clinton years (1999 to 2001), and you will see Summers's signature in the righthand corner. Since ascending to the position of university president, Summers has been a lightning rod of controversy. When faculty members on campus pushed a campaign to divest from Israel, Summers commented that the faculty members were being "anti-Semetic, in effect, if not in intent." He railed against rampant grade inflation, favored the return of a campus ROTC program that had been expelled from the campus at the height of the Vietnam War, supported global free trade, and criticized America's second most famous academic, Cornell West, of spending too much time composing "rap music". West was not, of course, recording rap music, but rather spoken word poetry. In other words, his viewpoints were moderate to conservative, but way out in right field from the perspective of the ultra-liberal Cambridge crowd. But nothing got him in more trouble than his comments about women in the fields of science and engineering. His theory about the lack of women in these fields was three-prong. First, the lack of women in these fields is due in large part to the same factor that handicaps the careers of women in just about every other field--women have babies. That's a career killer. Secondly, he believed that women might just be less skilled as men when it comes to these fields, and third, that socialization and discrimination were also at play, though to a lesser degree than the first two factors. Points one and three were hardly controversial. In fact, they're what the feminists have been saying for years. Point two--that women might not be suited to science and engineering--caused a firestorm that nearly burned Harvard down. His exact words are as follows: "So my best guess, to provoke you, of what's behind all of this is that the largest phenomenon, by far, is the general clash between people's legitimate family desires and employers' current desire for high power and high intensity, that in the special case of science and engineering, there are issues of intrinsic aptitude, and particularly of the variability of aptitude, and that those considerations are reinforced by what are in fact lesser factors involving socialization and continuing discrimination." (Emphasis added). At the risk of sounding like a chauvanist, I have to agree with Dr. Summers on this point. Outside the ivy walls of Harvard, most reasonable people accept that men and women are different. Both have strengths and weaknesses. This doesn't make women worse than men, or men worse than women, but simply complimentary to each other. I see this when I look at my mother and father--each knows the other's area of expertise. But don't tell this to the die-hard feminists. They believe that the only reason that men outpace women in the fields of science and engineering is because little girls are brought up to believe that those fields are not for women. It's really all socialization, you see. The real explanation for the lack of women in these fields has to do with how we, as a society, raise our children--little boys wear blue and play with trucks, little girls wear pink and play with Barbie. Boys are raised to be NASA scientists, girls are raised to be housewives. Well, if rigid gender are roles are to blame for the lack of women in the fields of science and engineering, then I guess the same could be said for the fields in which women outperform men. In case you were wondering, those fields include just about every other subject other than science and engineering. Women do better in English, foreign langauge, and social sciences. Women are more likely to graduate from high school, more likely to attend college, and more likely to graduate from college. Women are more likely to graduate at the top of their classes. Here at the University of Freiburg (Germany), women outnumber men in every one of my courses, sometimes by as many as three to one. In short, women perform better than men on just about everything, with the exception of math and science. Feminists conclude from this, that there must be an institutional bias against women in education. Give me a break. This does not mean that girls interested in science should not pursue an education in that field, if that's what they really want. There are exceptions to every rule, and I'm sure that there are some women who do quite well with quantum physics and string theory. More power to them. But exceptions to the rule are just that--exceptions. So long as they are the exceptions, we can't expect that women will make up a proportional part of the engineering departments at top universities. All of the feminist moaning and affirmative action programs in the world won't change that. But, to be sure, the whole Summers saga really had less to do with gender equality than it had to do with the climate of small-mindedness on American campuses. Our great institutions of learning no longer value opinions that run contrary to established "politically correct" cathechisms. An ideal university should be a place of learning, where ideas clash and great minds debate, regardless of whose feelings get hurt. It should be a place where students and faculty can pursue ideas wherever the ideas might lead them. It should not be a place in which some ideas are deemed heresy, simply because intolerant campus leftists can't stomach them. George Orwell, esteemed author of 1984 and Animal Farm put it best when he said "If liberty means anything at all it means the right to tell people what they do not want to hear." Liberty is in danger on our college campuses today. When Dr. Summers gave his famous speech last year, MIT biology professor Nancy Hopkins walked out of the conference. She told reporters that if she hadn't, she "would have either blacked out or thrown up." I have some advice for Professor Hopkins. Maybe she should find a new career. After all, if the voicing of an alternative opinion brings her to the brink of vomiting and losing consciousness, she ought not be a scientist or a professor. Both fields require people with open minds, who do not have intense emotional reactions to theories not to their liking. Hopkins continued, saying: "When he started talking about innate differences in aptitude between men and women, I just couldn't breathe because this kind of bias makes me physically ill."
No, President Summers doesn't have the bias here. If Professor Hopkins wants to talk about bias, she ought to look in the mirror. She dismisses out of hand all ideas that clash with her own feminism. As a citizen, she can hold whatever opinion she wants. As a scientist and educator at America's most prestigious engineering institute, she should check her feminism at the door. Unfortunately, all too often, educators like Nancy Hopkins don't know how to do that. The problem is much bigger, of course, than Harvard University. My own University of Massachusetts has serious problems with openness of speech and thought. If you're a card-carrying leftist, you will never have to worry about being silenced. But if you're moderate to right-wing, as I am, expect to be greeted with hostility and even university disciplinary actions for speaking your mind. At very least, it will take a lot of courage, and some students would just prefer to remain silent than to be accused of racism, sexism, war-mongering, and genocide. All of this is old news, of course. Summers made his "outrageous" statements last January, and has spent the last year fighting to keep his position and to manage a school that has become unmanageable. 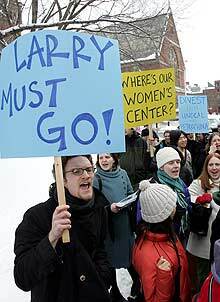 On March 15, 2005, the Faculty of Arts and Sciences passed a vote of "lack of confidence" in President Larry Summers. This was a non-binding resolution, due to the fact that only the seven member board of the Harvard Corporation has the authority to fire a university president. However, this did not bode well for the embattled Larry Summers. Summers does enjoy some campus support. Among undergraduates, for example, only 19% believed that he should resign. Most of the pressure seemed to have come from the faculty, who voted "lack of confidence" in March 2005. 218 in were in favor of the resolution, but a respectable 185 were against it. Steven Pinker, a noted psychologist and Harvard professor, was asked if Summers's comments were "within the pale of legitimate academic discourse." His response? "Good grief, shouldn’t everything be within the pale of legitimate academic discourse?... There is certainly enough evidence for the hypothesis to be taken seriously." On February 22, 2006, Summers announced his resignation. To be sure, Summers was not fired for his views. He was simply railroaded into "voluntarily" stepping down from his post. If only he had refered to the the victims of 9/11 as "Little Eichmanns" he might have the solid support of the academic community. Unfortunately, he does not. Summers's ideas, which seemed pretty rational to low-brow folks such as myself, were rejected repeatedly by Harvard faculty members. For Summers, it cost him his job. For Harvard, it cost them a brilliant and capable president. I chalk it up to university intolerance, a disease that has infected most institutions of higher learning since before I was born. I think it worth pointing out that he was not talking about the average man or the average women. He was talking about the extreme end of the bell curve showing aptitude for science. At that point on the scale, men outnumber women. It seems to me that this is a scientific result, which like all scientific results can be questioned or accepted. If someone thought it false, they could repeat the tests in the hope of coming up with an different result. I think the fact that Summers is going shows that the issue was NOT the truth of the test but the fact that uncomfortable facts have to be swept under the carpet. In your opost you wrote that we are "in danger" of losing our academic libery on campus. I say its already been lost. There is not one time I felt comfortable saying what I felt in either law school or college because my views are anti-leftist. If you are a fraudluent blatantly deceptive clown like Ward 'The Indian' Churchill, you will be defended and pushed from the front page on campus until people forget about you and you can continue your tenured mockery of the education system under the radar. If you even so much as dare and suggest the obvious- that men and women have physiologic and biologic differences- you lose your job and are branded 'biased' for life. Academic freedom and liberty is a thing of the past; its been gone since at least the 1980's. It covers job portal related subjects.